Publication | On the significance of incorporating shoreline changes for evaluating coastal hydrodynamics under sea level rise scenarios – Matthew V. Bilskie, Ph.D.
D.L. Passeri, S.C. Hagen, M.V. Bilskie, S.C. Medeiros, (2014). “On the significance of incorporating shoreline changes for evaluating coastal hydrodynamics under sea level rise scenarios.” Natural Hazards, doi:10.1007/s11069-014-1386-y. Abstract: The influence of including the dynamic effects of future shoreline changes associated with sea level rise into hydrodynamic modeling is evaluated for the coast of the Northern Gulf of Mexico from Mobile Bay, AL to St. Andrew Bay, FL. 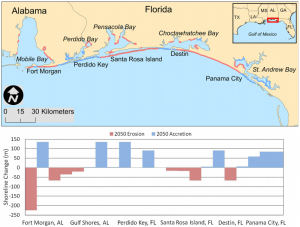 A two-dimensional, depth-integrated hydrodynamic model forced by astronomic tides and hurricane winds and pressures representative of Hurricanes Ivan (2004), Dennis (2005) and Katrina (2005) is used to simulate present conditions, 2050 projected sea level (0.46 m rise) with present-day shorelines, and 2050 sea level with projected 2050 shorelines. 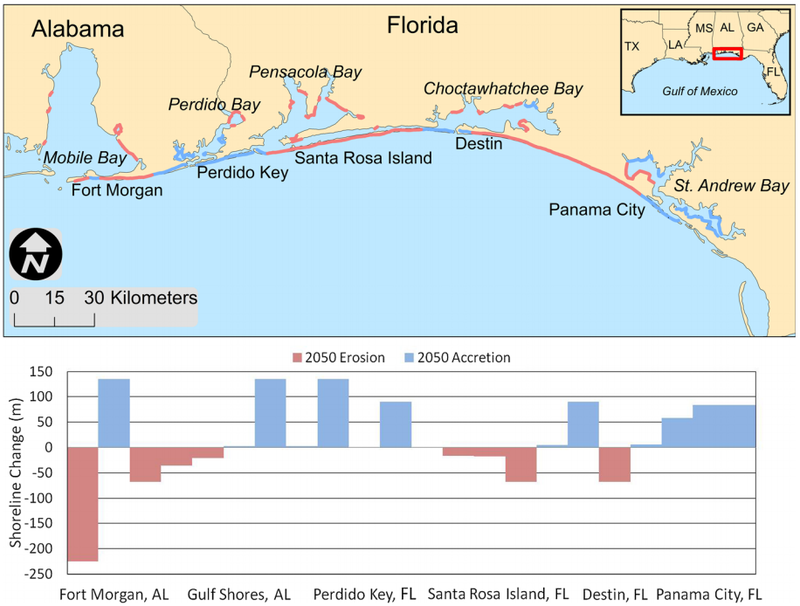 The 2050 shoreline and nearshore morphology are projected using Coastal Vulnerability Index shoreline change rates to determine the position of the new Gulf and bay shorelines, while the active beach profile is shifted horizontally according to the amount of erosion or accretion, and vertically to keep pace with rising seas. Hydrodynamic model results show that taking a dynamic approach to modeling sea level rise (as opposed to a static, or ‘‘bathtub’’ approach) increases tidal ranges and tidal prisms within the bay systems. Incorporating the projected shoreline changes does not alter tidal ranges, but some bays experience changes in tidal prisms depending on whether the planform area of the bay increases or decreases with the projected erosion or accretion. Barrier islands with projected erosion are vulnerable to increased overtopping from storm surge inundation, which impels more water into the back-bays and increases the inland inundation extent and magnitude. Inundation along barrier islands with projected accretion remains relatively the same as inundation under present-day shorelines, which prevents additional overtopping and limits more water from entering back-bays. Results demonstrate that although modeling sea level rise as a dynamic process is necessary, the incorporation of shoreline changes has variable impacts when evaluating future hydrodynamics and the response of the coastal system to sea level rise.